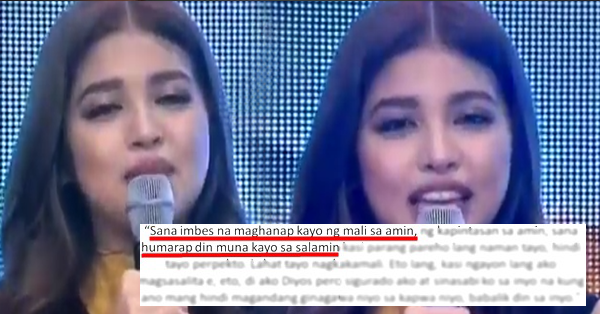 Viral: Terrible Speech by Maine Mendoza for Her Bashers! Could anyone tell me, who does not know the kalyeserye story of ALDUB? where Alden Richards portrays fictionalized version of himelf and Maine Mendoza as Yaya Dub (Divina Ursula Bokbokova Smash) a playful reverse name for dubsmash. The super couple are very popular with their love team that their only communication is through audio dubbing of popular songs. This kalyeserye can be seen in one of the best variety shows in GMA 7, Eat Bulaga. Because of this, the rating of the show get more higher because almost all of the viewers are hooked to the love story. But the more you become famous the more fans you have and also more bashers are just around the corner. Maine Mendoza speaks out to her bashers during her 21st Birthday Celebration.